Congress opens door to Priyanka, formally. 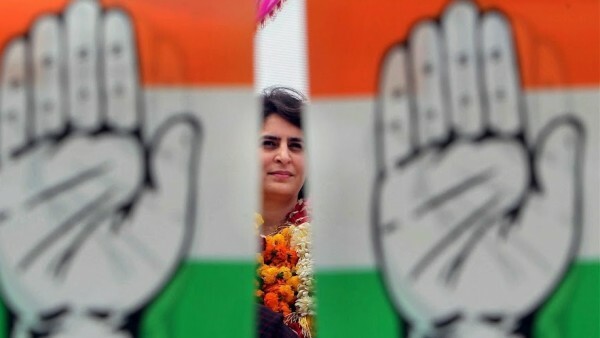 Priyanka Gandhi Vadra, considered for long the "trump card" of the Congress, has been launched into active politics from Uttar Pradesh, a state that's considered the gateway to Delhi. While the state, with its 80 seats, is seen as the biggest battleground, the youngest Gandhi has been pitched into its thickest. The bold move by the Congress has stirred the BJP already faced with the lethal SP-BSP combine in the critical state of UP. In fact, Priyanka has been para-dropped into eastern Uttar Pradesh represented by the BJP's two biggest mascots - Prime Minister Narendra Modi, who has his constituency in Varanasi and Chief Minister Yogi Adityanath, who considers Gorakhpur his political home. The party holds 70 of the state's 80 seats. The battle is surely on for 2019. Priyanka Gandhi’s official entry into politics has come as a “shocker” for the BJP even as it was preparing to counter the newly formed alliance of the Samajwadi Party and Bahujan Samaj Party (BSP) in Uttar Pradesh. But a senior party leader who did not wish to be identified said that Priyanka Gandhi would definitely be a crowd puller but it needed to be seen how she converts them into votes. A party office-bearer added that the decision to ask Priyanka Gandhi to oversee eastern Uttar Pradesh was unexpected. Another party office-bearer said the BJP was yet to devise a strategy to counter the SP-BSP alliance when the Priyanka factor had come into play. In a veiled attack, Union Minister of State for Communications Manoj Sinha said that anybody becoming the “AICC General Secretary or in-charge will not matter in the polls”. He said that people in Uttar Pradesh have not even taken notice of the development. “The discussion about Priyanka Gandhi being made the General Secretary is mostly in Delhi and among you people (media). People in the region of which she has been made in-charge have not even taken notice of this,” Sinha said. “If someone is made the General Secretary or in-charge, I think it is not going to make any difference to the elections,” Sinha, who is a Lok Sabha member from Ghazipur in eastern Uttar Pradesh, said. Sinha said he has since Wednesday “spoken with 1,000 to 2,000 people” from eastern Uttar Pradesh. He also condemned the language used by Congress President Rahul Gandhi at his public meetings in Raebareli and Amethi earlier in the day. He said that the promise of farmer loan waiver made by Rahul Gandhi was hogwash and actually no loans are being waived. “They (Congress) must first fulfil the promises they made to farmers in Madhya Pradesh, Chhattisgarh and Rajasthan and then we will see. The fact is that the Congress party’s promise of loan waiver was a fraud,” he said. Sinha added that farmers who are unable to repay their loans are being arrested in Karnataka, while farmers are continuing to commit suicide in Rajasthan, Madhya Pradesh and Chhattisgarh. He ruled out the possibility of Uttar Pradesh government planning any loan waiver for farmers ahead of polls. “We are in principle not for waiving farm loans. We want to help farmers by reducing input cost and giving a good price for their produce so that they can make more meaningful contribution to the economy and become self-reliant,” he said. As the BJP appeared dismissive of Priyanka Gandhi’s entry into politics, the Congress said it reflected the ruling party’s anxiety and nervousness. Among the latest from the BJP to ridicule the move is Lok Sabha Speaker Sumitra Mahajan who said Priyanka Gandhi’s entry into politics indicated that Congress President Rahul Gandhi “can’t do politics all alone”. Reacting to the remarks, Congress spokesperson Manish Tewari said she should focus on BJP’s internal matters. “We would humbly request the Speaker to kindly focus on BJP’s internal issues. So far as Congress is concerned, we are doing well without her advice and will continue to do so,” Tewari told the media. Referring to various BJP leaders’ move to target Rahul Gandhi and the Congress over dynasty politics, Tewari said the BJP was nervous and anxious because of Priyanka Gandhi’s entry into politics. “What matters most in politics is popularity, and Priyanka Gandhi commands massive popularity. So BJP’s anxiety and nervousness are not unnatural,” added Tewari.